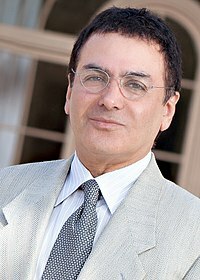 Firouz Michael Naderi (born in Shiraz, Iran) is an Iranian-American scientist and currently the Director for Solar System Exploration at NASA‘s Jet Propulsion Laboratory (JPL). In this role Naderi oversees JPL’s robotic solar system missions in planning (such as a mission to the Jupiter’s moon Europa) or, in development (InSight lander on Mars) and operating missions, including the Cassini orbiter at Saturn, the Dawn spacecraft at the giant asteroid Vesta, JUNO on its way to Jupiter. He was named head of the Mars Exploration Program at JPL in 2000 . In the summer of 2000 he helped re-plan the Program as a chain of scientifically, technologically and operationally interrelated missions with a spacecraft launch to Mars every two years. He led the Program for the next five years, a span of time that included the successful landing of the Mars Exploration Rovers, Spirit and Opportunity. NASA’s highest award – the Distinguished Service Medal. This entry was posted in Science and tagged Iranian-Americans, NASA, Science. Bookmark the permalink.